When it comes to storing recipes (especially if you're a recipe hoarder like me), it wouldn't hurt to bring a little organization and convenience in to the mix. Well, I'm super excited to let you all know about a new feature here at The Two Bite Club that will help with that. I'm am fan of anything that helps me simplify my life! I'm sure many of you may have already heard about ZipList, seeing as they are partnered with some of the best food websites and blogs out there on the worldwide web. If you're not familiar with Ziplist, I'm excited to be the one to introduce you to the awesomeness! I've put together a little tutorial to show you the basics of how it works. In the navigation bar, you'll see the Recipe Box option. When you click on it, there will be a drop down menu. You can then choose to navigate to your personal Recipe Box, Shopping List or Meal Planner. 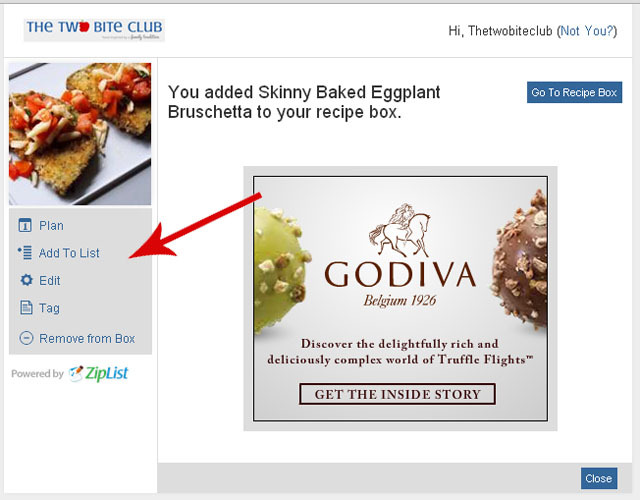 You'll find this Recipe Box link, and be able to access your personalized recipe box, on all of the sites using ZipList. See that little blue Save Recipe icon? That's how you'll save recipes from The Two Bite Club to your ZipList Recipe Box. Once you click Save Recipe, you'll get confirmation that you have indeed saved the recipe, and from there you'll have option to add the recipe to your Meal Planner, Shopping List, or even edit the recipe to suit your preferences. Sweet, right? I told you you'd like it. You can easily navigate back to my blog and continue browsing and saving any recipes that strike your fancy. Easy peasy! When you're ready to hit the store, you can access your shopping list on your mobile device (using ZipList's free app). Try it out and let me know if you have any questions. Hope you like it!